Marc Rogoff has held a number of senior positions in the Solid Waste Association of North America (SWANA) and the American Public Works Association. Following on from his BS and MS at Cornell University, Marc completed a PhD at Michigan State University and an MBA at the University of Tampa. His career has embraced all aspects of solid waste management, and he has directed engineer’s feasibility reports for nearly two dozen public works projects, totaling $1.2bn in project financing. His name is well known in the field of Waste-to-Energy, where his consultancy work has covered feasibility studies on more than 50 facilities worldwide, operations assessments, and advising on key procurement decisions. Francois Screve is the founder of Deltaway Energy, Inc, San Francisco. 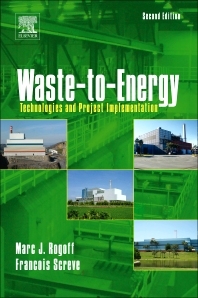 He has 20 years of experience in the municipal solid waste-to-energy plant design and operation field with six years in Europe, 12 years in the USA, and two years in Asia. Francois holds mechanical engineering and MBA degrees, as well as a WTE chief operator certificate from the ASME/EPA in the USA. He managed the Long Beach Steinmuller 1,400 TPD waste-to-energy facility in California and was responsible for the operation of the 4,200 TPD refuse-derived fuel facility of Miami-Dade County, Florida, one of the largest facilities in the world. He was vice president for Onyx, a subsidiary of Vivendi Environnement, overseeing the operation of eight facilities and the design of three new plants in Asia. He received his an MBA from INSA Lille and his Mechanical, Electrical Engineering MS from Ecole Nationale Supérieure d'Arts et Métiers.